PARENTS! We need your help for Carnegie. Do you know a possible corporate sponsor? Let us know here. Did you know that the Mira Costa High School Music Program won a GRAMMY in 2014? The award winning Costa Bands and Orchestra Programs provide almost 300 students an environment to grow and develop artistically, intellectually and emotionally. This approach to arts education not only helps us produce great music, but also confident, collaborative, creative and academically successful students with valuable skills that extend beyond music. This amazing organization has been honored with an invitation to perform at Carnegie Hall in front of 1500 patrons as part of the Distinguished Concerts International New York Series. Taking three band ensembles and two orchestras to New York’s Carnegie Hall requires everyone to work together. Students are practicing, parents are organizing, but travel for a group this size is costly and a complex logistical operation. Instrument transportation and/or rental alone for both band and orchestra are estimated at $26,000! There is also a need to provide financial assistance for some students who want to join their peers in this incredible opportunity, but are unable to fully afford the trip. To get from Costa to Carnegie, we need your help. We are seeking corporate sponsors so these talented young musicians can go to New York and represent the South Bay. 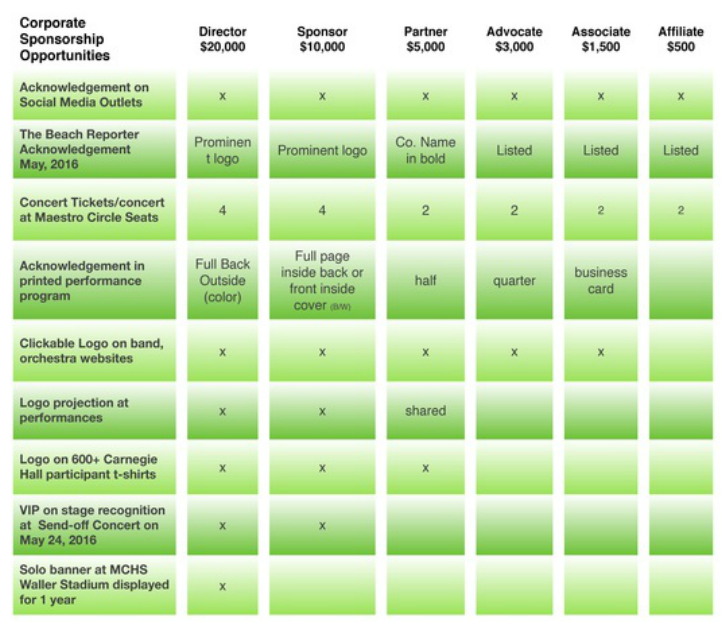 Below is our available Sponsorship Tiers and the benefits we are able to offer. All contributions are tax deductible! KNOW A POSSIBLE CORPORATe SPONSOR? Let us know.